All operations are carried out in fume hoods with excellent exhaust systems. Labs are adequately equipped to carry out various types of reactions including hydrogenations and moisture sensitive reactions. For natural product isolation Soxhlet extraction equipment, heating mantles, rotavapors with diaphragm pumps are routinely being used. Several natural leads have been used to make more potent products. 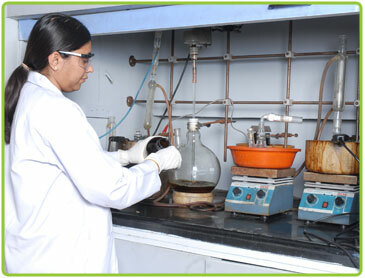 Apart from developing new patent non infringing processes for various pharma actives, new chemical entities are routinely synthesized for various therapeutic segments.